Welcome to another brush post! Today is all about my very favourites when it comes to brushes, one’s i’m most likely to use every single day. Overall my go-to brushes are the Tom Ford and Hakuhodo ones. I like them for durability and their soft feel. As much as i’d love to love the likes of MAC or Sigma, I find them a bit too scratchy, especially now since i’ve been spoilt with these high quality luxury ones. So here’s a look at my favourites. i’ve included face brushes as well as eye brushes. Ok so jumping right in! Starting with eye brushes. For the most part I use exclusively TF eye brushes. 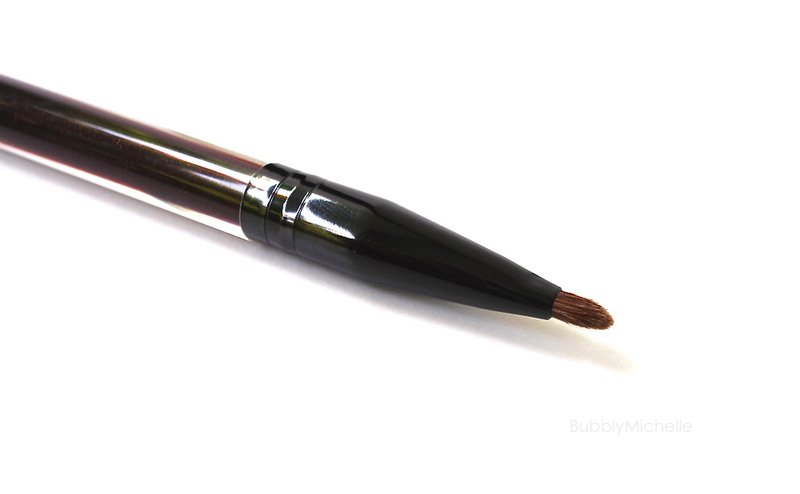 I love the longer handles of these that give the brushes good balance and also the brush shapes and density of the bristles are perfectly designed to suit my day to day needs of eyeshadow application. For base colour application my go to is either the Hakuhodo J5523 or the Tom Ford 11. The TF 11 is slightly larger than most round flat brushes i’ve come across and it’s easy to get quick and even coverage on the entire lid in half the time. I really love the density of this which is slightly bigger & chubbier than regular flat brushes and pick up more product. Also the bristles are made of very soft goat hair and feel whisper soft on the lid. 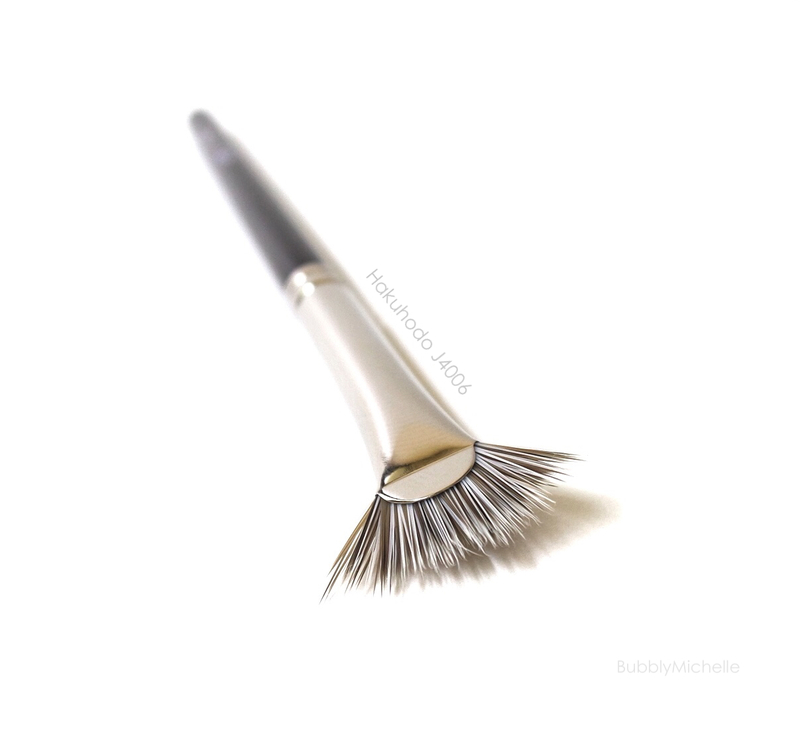 The Hakuhodo J5523 is my must have eye brush from all the Hakuhodo eye brushes. 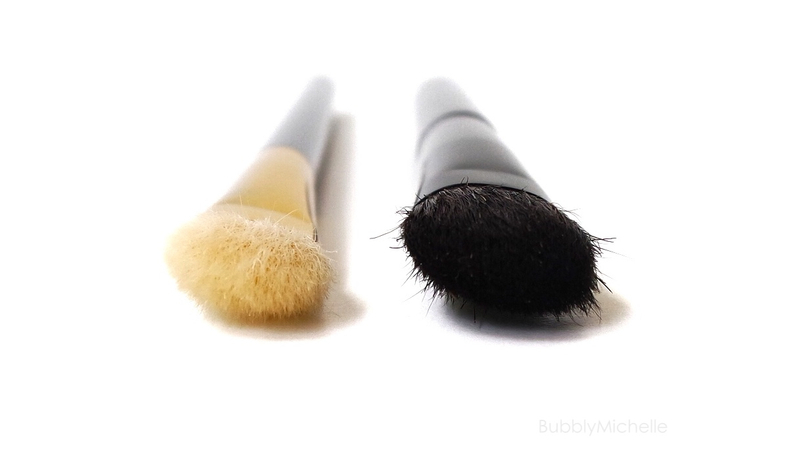 It’s a soft fluffy blender brush that’s perfectly shaped for softening the edges of your eyeshadow. Most day’s i’d use just this one brush to apply eyeshadow, blend and smoke out 2 to 3 shades of eyeshadow without having to change my brush. To read more on this brush, head here. For a quick comparison here’s a look at brush tips. As you can see, the TF 13 is mush longer and round in bristle arrangement while the Hakuhodo is more of a fluffy paddle shape. This shorter bristle length allows for more control and firmer strokes, perfect for blending out eyeshadow with minimal effort. Now onto another must have brush from Hakuhodo, the J 4006. This is a brush specially created to take off any mascara clumps off your lashes. I believe everyone should own one of these as they do a fabulous job cleaning up excess mascara as well as separate clumped up lashes. I never forget to pack this even if i’m going on a short vacay. 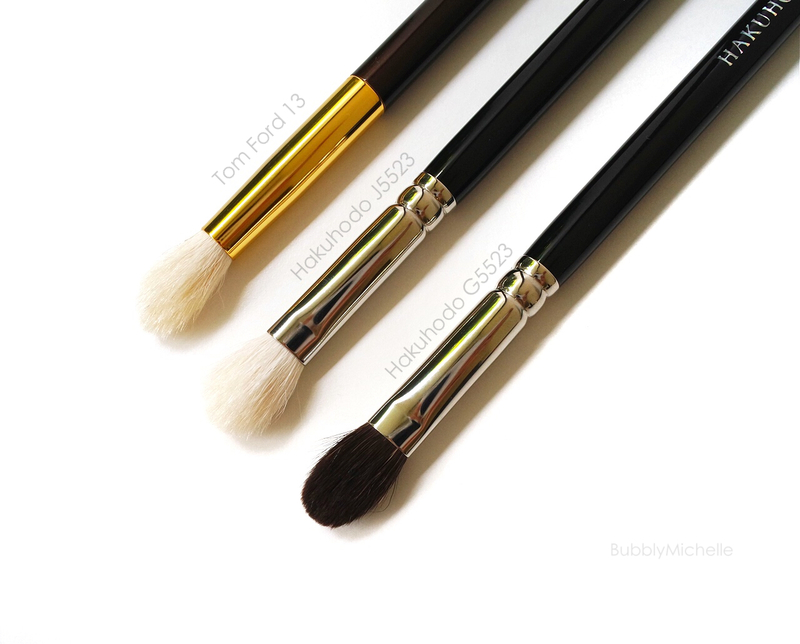 Another two essential brushes in my stash are the Tom ford 12 and 15. I find the Tom Ford 15 Eyeliner and Definer brush perfect for smudging. I use this after I line my eyes with a pencil liner and go over it with this brush to create a neat, yet softened liner look. I specially love that it’s firm and makes smudging a breeze as it offers more control. It’s also great for setting pencil liner with eyeshadow and allows you to work really close to the lash line. Tom Ford 12 the Eyeshadow Contour brush (below right) is for those of you who like defined cut creases and allows you to create sharp graphic lines at the outer corner. I also like using this for creating a smokier thicker lined look as this is incredibly dense and is perfect for that. The angled edge also is perfectly designed to fit the contours of the eye and glide across and is one of the more unique brush shapes that Tom Ford offers. I highly recommend this one. I’ll be discussing 5 today. One bronzer brush, a blush brush, concealer brush, a brush designated for Guerlain Meteorites and a brush I use solely for applying powder around the under eye. As you can see, it’s a matter of finding brushes for your own personal needs whatever they may be! 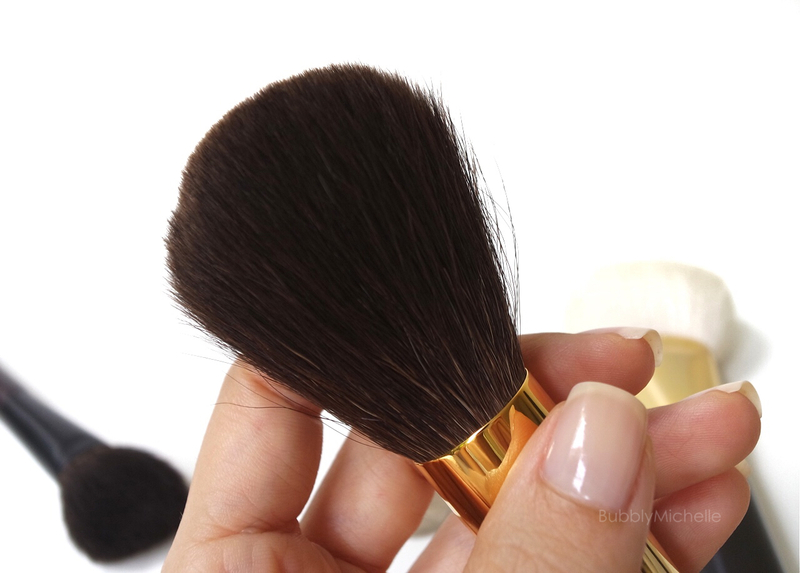 Let’s start with the Tom Ford Bronzer brush. This is possibly the biggest powder brush known to man! Hakuhodo doesn’t offer anything quite similar to this mammoth of a brush. The bristles are tightly packed to create a fluffy, dense brush head which allows for covering a larger portion if your face in one swirl. If you apply your bronzer liberally all over the face, the extra large brush head works great for this. Also note the bristles are soft and feel very gentle on the skin. As far as face brushes go, this is an indulgence! Here’s a closer look at it’s fluffy white bristles against my tiny hand. Next up, my another favourite Hakuhodo brush that I use exclusively with my Guerlain Meteorites. This is an ultra soft blue squirrel brush and quite delicate. The softest bristles I have come across. The fineness of the bristles allow it to pick just the right amount of product to do a light dusting all over my face without overloading the product. My only beef with this brush is that the slanted end of the handle makes the tip prone to chipping. And at this price range the last thing you need is a fragile handle. If I’d known, i’d have much rather picked up the same brush from the black S series brushes which are definitely sleeker. Now on to blush brushes and I can finally say I have found the ONE. 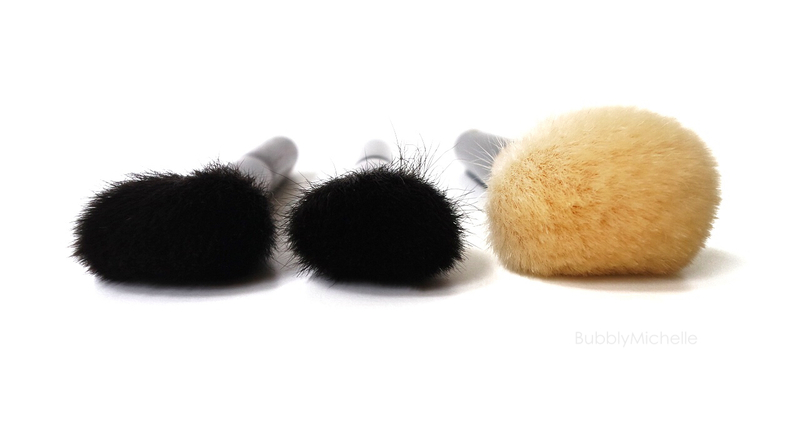 For the longest time I used my TF blush brush and none other, until…. I purchased the Chikuhodo Z4. It was one of the softest brushes in my collection. Of course only until the Hakuhodo pop up store set up camp at Takashimaya again and I had to go check out the Kokutan series and the rest was history as they say. 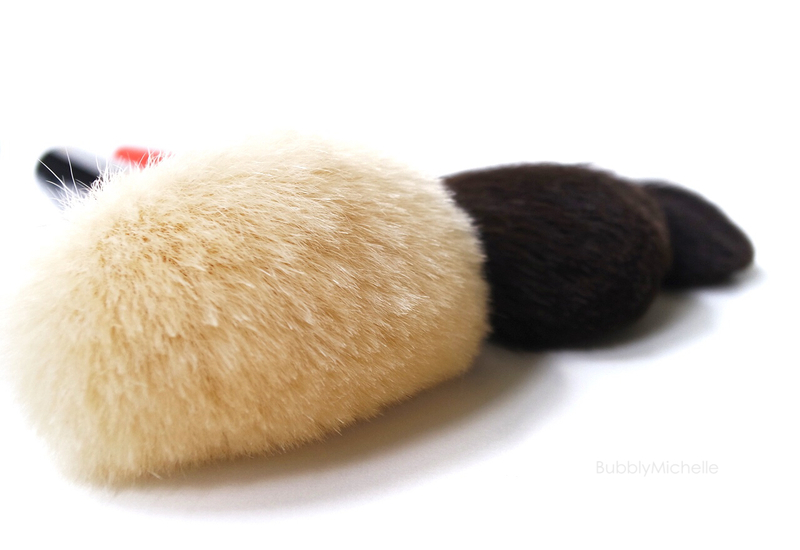 The Kokutan blush brush is the silkiest and softest cheek brush I have ever owned. The bristles are packed with medium density and are slightly longer than the Z4 which allows it more freedom of movement therefore making it whisper soft while applying your powders. The shape is similar to the Chikuhodo Z4 but flatter and larger. 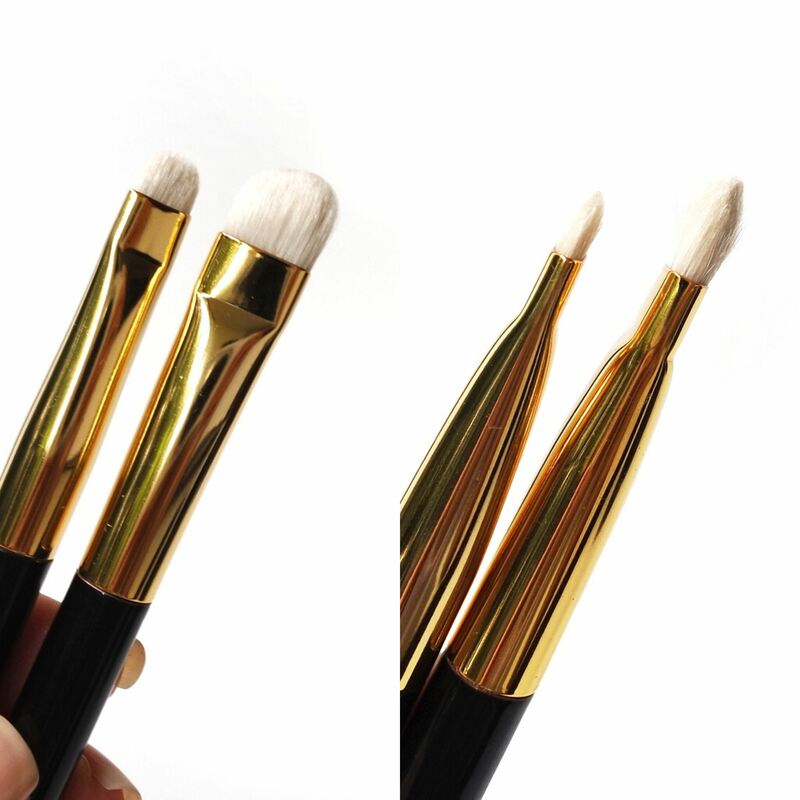 In contrast to the Tom Ford brush which is designed with maximum density and a more domed end which allows for blending blush at a direct vertical angle as opposed to the Hakuhodo one which allows for sweeping brush strokes using the sides of the brush, between the two, the Hakuhodo is definitely better at adding a soft layer of colour and gradually building intensity. Also the difference in bristles, (the Hakuhodo blue squirrel compared to the Tom Fords goat hair) picks up much less product making it great for layered application rather than full on ‘POW’ blush application which works great for soft powdery blushes as well as highly pigmented ones where you want to pick up just a tiny bit at a time. 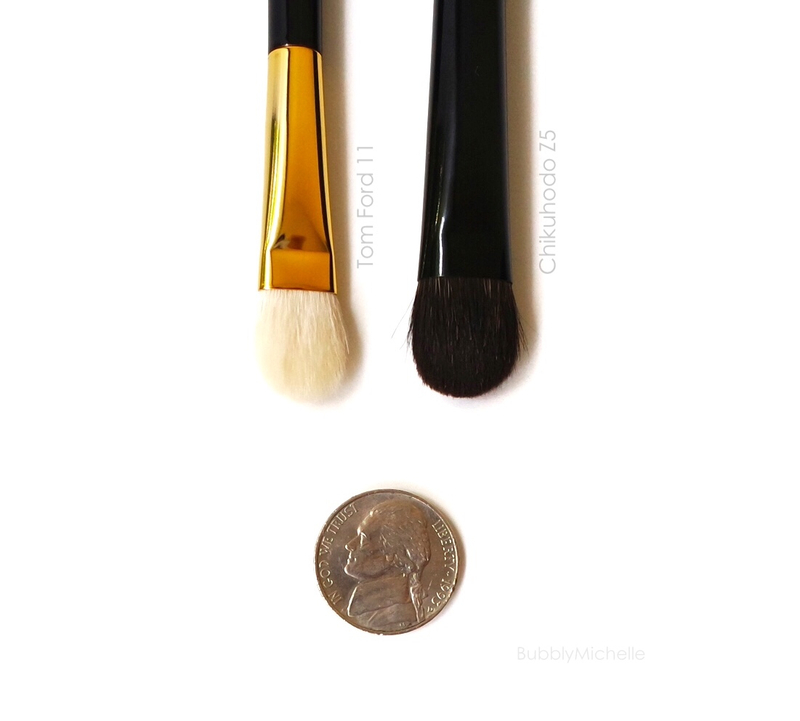 Here’s comparison photo of brush tips so you get a closer look at the size and shape. Overall according to my needs, the Hakuhodo blush brush excels over the others. Of course this is highly subjective given each of your personal needs may be different to mine. If you are someone who reach for less pigmented blushes or prefer and intense blush application using highly pigmented blushes, then i’d say go for the Tom Ford. You will love it. Next let’s discuss my newest brush addition. The Kevyn Aucoin concealer brush which I just picked up mere months ago after lemming for years. Since I don’t buy brushes sight unseen, I had to wait for the chance to see these in person. Enter trip to London. I finally FINALLY saw it in person and yes, it was the perfect density and size for spot concealing. The brush tip is very short and stubby. 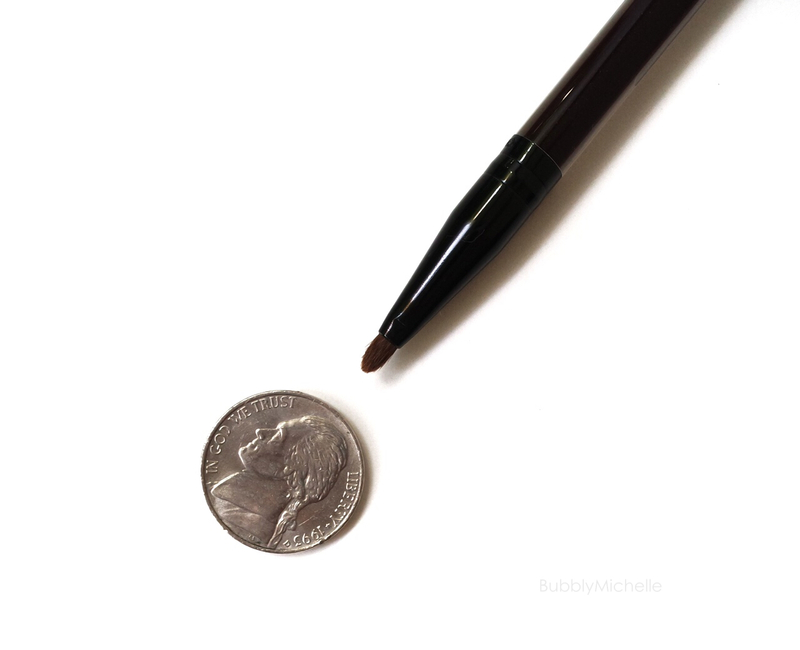 It’s also very densely packed giving it a very firm tip, which is perfect precision concealer application for hiding spots. I also photographed it with a quarter so you could estimate just how small this is. my preferred use for this is setting under eyes with powder. Let me tell you why. If you look closely you’d notice that the brush is far too chubby in the middle to reach the inner corners of the eye effectively. As much as I love big flat brushes for laying down colour, in comparison to the Tom Ford one I discussed before, this is just giant! So I decided to put is to use as a face brush, on smaller areas of my face, such as the under eyes or around the nose; the size is perfect for this. The dense yet fluffy soft bristles pick up enough powder for setting and the softness of the bristles feel very gentle on the delicate under eye area which I usually handle with utmost care. And there you have it. The round up of my favourites! It’s taken me a while to find the perfect one for each task yet so worth it in the end. My next quest is finding the perfect powder brush and maybe an under eye concealer brush. 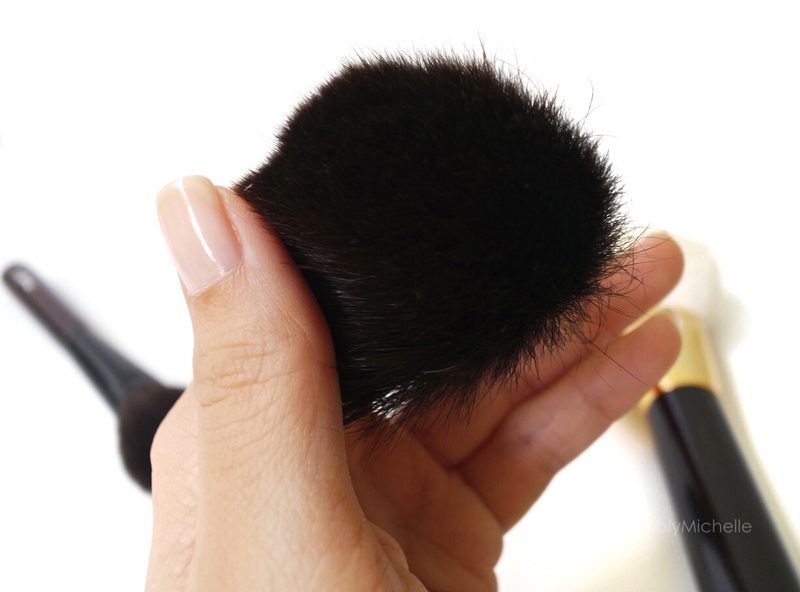 I’ve been thinking of the Suqqu powder brush with it’s perfectly domed shape.. btI feel it might be slightly too big for my small face but if you have tried this, i’d love to hear your thoughts on it! Also let me know any other brush suggestions that you feel work great with powder, I definitely need help deciding where to start looking! Yes, mild baby soaps work best. Just treat your brushes as they were your own hair 🙂 I always like baby shampoos n such which don’t dry out the bristles and are very gentle while cleansing. For me it’s the opposite! I prefer the Tom Ford eye brushes more! But i’m keen to add some of the TF face brushes to my stash. Never had the need before.. but now I just came up with one! Lol! Where can I buy the hakuhodo brushes from ?? This is a great post !!!!! You can buy their brushes from their online site 🙂 They ship worldwide I believe! Any stores that sell so i can see them ?? Thanks for the great brush review. I have very pale skin. I use Chantecaille Furture Skin in the color Porcelain. Since I am so pale I have to be very careful not to over apply my makeup. I mostly used brushes that are of squirrel hair and a light density. My favorite brands are Chikuhodo and Suqqu. 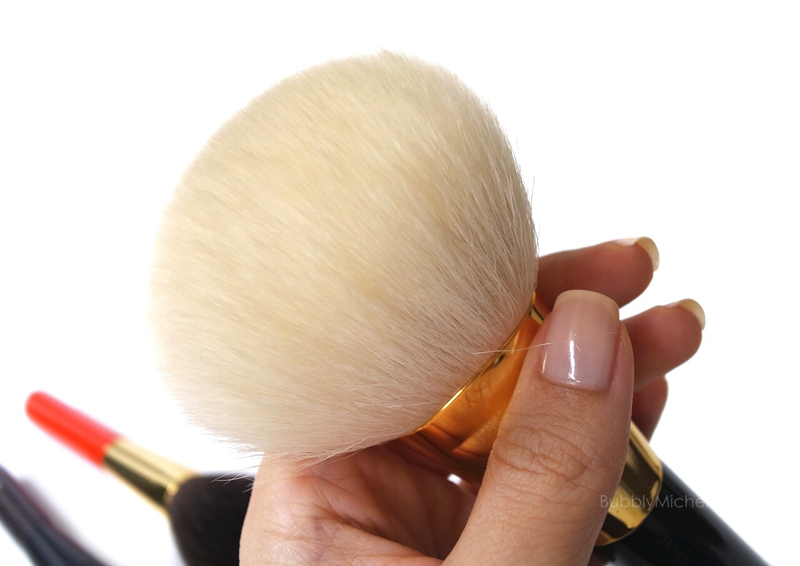 Chikuhodo z1- I use this brush to apply my Guerlain Meteroites voyage compact. The z1 is the perfect density to pick up the pressed powder product. The z-9, Chikuhodo makie series mk1, and the Suqqu face brushes are not dense enough to pick up enough product. Chikuhodo z-9 and Makie MK1- these 2 brushes are about identical. If you have one you definently do not not need the other. 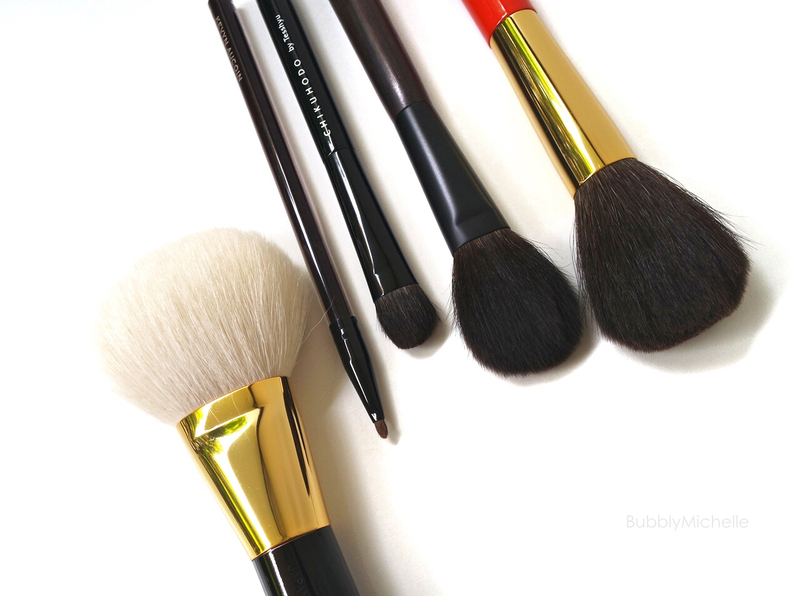 I like to use these brushes to apply my HourGlass ambiant lighting powders and Guerlain Meteroites Pearls. I am able to apply a light dusting of product with these brushes. If I needed to use setting powder all over my face then I would use one of these brushes. Since I only need to use a setting powder in my t zone I prefer to use a much smaller brush. Suqqu Face Brush- I also use this to apply my hourglass ambiant lighting powers and Guerlain Meteroite Pearls. If I could do it all over again I would not buy the Suqqu face brush. The hair on the Suqqu brush is the same hair used on the Chikuhodo z series and Makie Series. Also, the Suqqu face and the z-9 and Makie 1 are of the same density. When I do a blind test I can’t tell the difference. The Chikuhodo brushes are at least $100 cheaper than the Suqqu face brush. Finally the Suqqu face brush is also to large to apply powder to just my t zone. 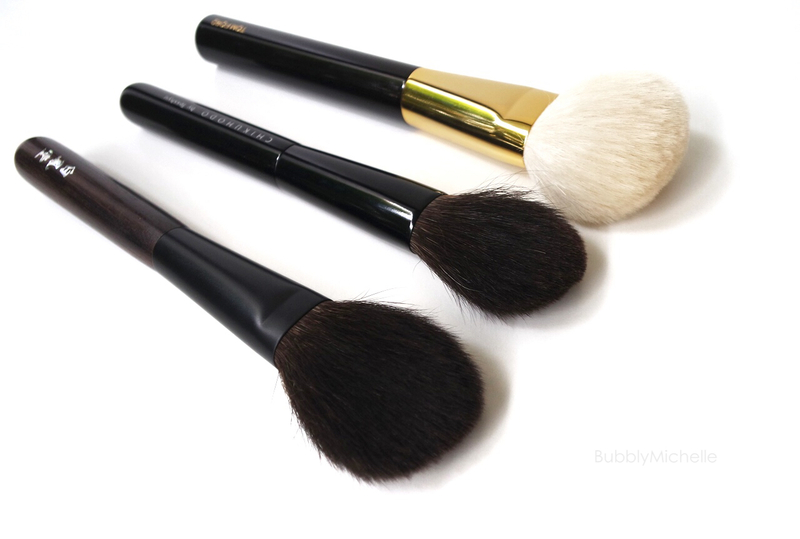 Suqqu cheek brush- this is my all time favorite brush. I only have 1 and I use it for blush. I wish I could buy two more. I would like another one for setting powder in my t zone. It is the perfect size. I would also like one just for bronzer. I wish I would have spent my money on another Suqqu cheek brush instead of buying the Suqqu face brush. I also have the z4 and z8. I completely agree with what you said about the z4 for blush application. Thank you for your suggestions! I had the same fear about the Suqqu face brush being too large to use on certain portions of the face. Ideally i’d pick up the blush brush too but unfortunately I hate buying online and just enjoy coming home with a product as soon as I pay for it! How does the z-4 compares to the z-8 please? Hi Erica…I know this comment is terribly old, but if you’re still around these parts of the Web, I’m curious as to why you picked the MK-1 vs the MK-2. Some people say they’re the same, but after some research, the shapes are actually different despite the brush heads being the same measurements. Anyway, I’m just curious as to why you picked one over the other as I’m trying to decide between the two specifically for my Hourglass Ambient Lighting Powders. Thanks if you happen to see this and reply! I actually use a lot of cream blushes and highlighters. What kind of brush do you recommend for those kind of products? Thanks! I find that a cream foundation brush or fingers work best with cream products 🙂 I don’t own any special brushes for cream products. WOW! 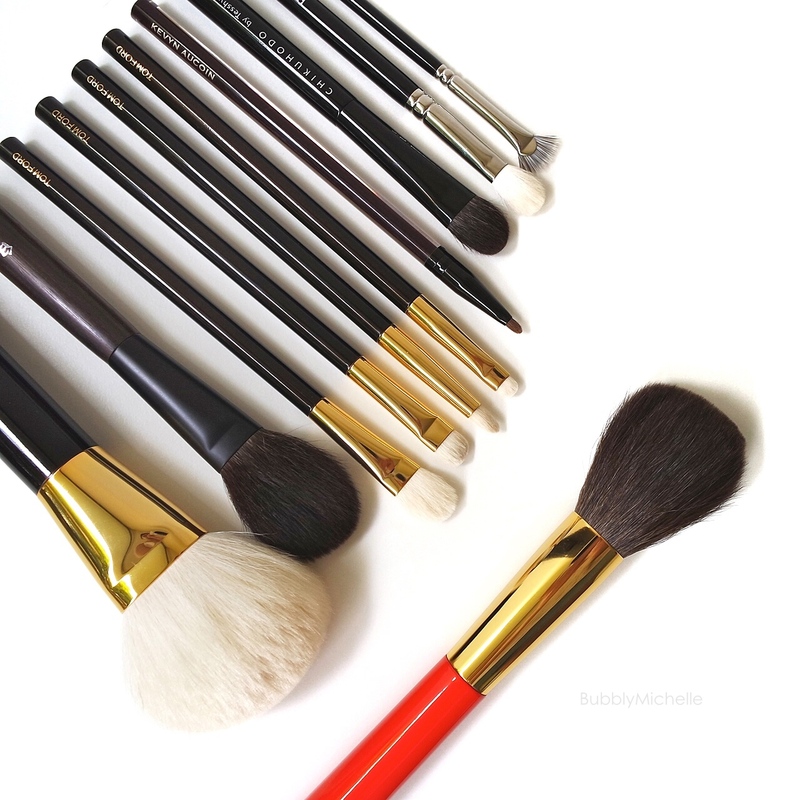 your favourite makeup brushes are soooo amazing! Thanks! I’ve been collecting them over the years 🙂 I hope you get to pick some up for yourself too! Soon! 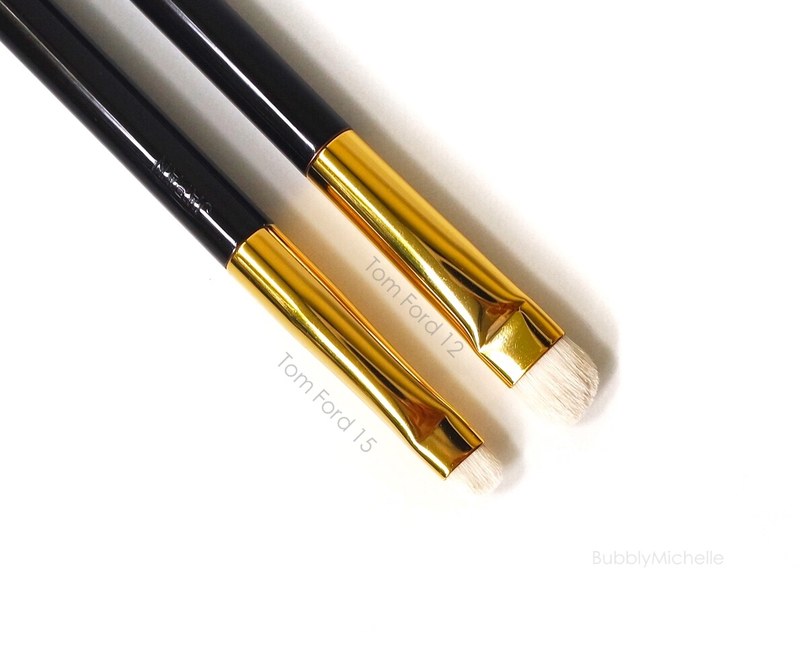 Oh I love your posts especially the ones related to brushes!Thank go Tom Ford beauty just arrived in Greece and now we don’t have to order them from London!I really want to try the brushes from the range,especially now that I saw your raves! Glad I helped you narrow down some picks from TF, they are some of the best out there. Hi Michelle, I know you posted this a month or so ago but being a new follower of your blog am just now catching up! 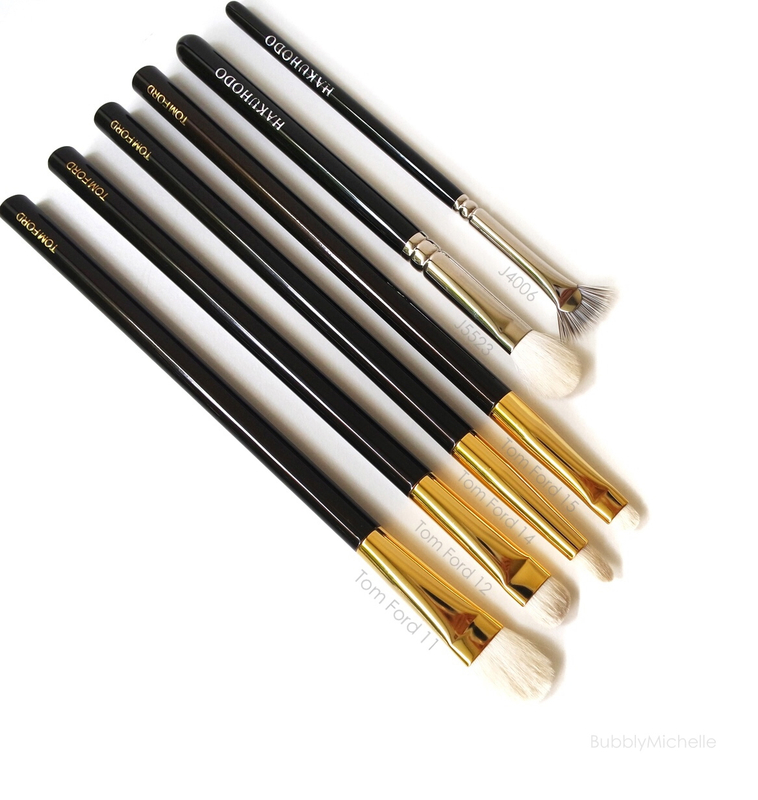 I am looking to invest in some TF brushes and the one am having a hard time matching/finding is the TF14 brush you mentioned, as the TF website nor does Neiman Marcus have them listed by number just by name so is #14 called the “smokey eye” brush or is it the “eye shadow blend”? brush please let me. Also just need to say, I love how natural and beautiful not only you are, but also your makeup! In all honesty in a sea of overdone caked on makeup blogger/vlogger madness you look flawless! 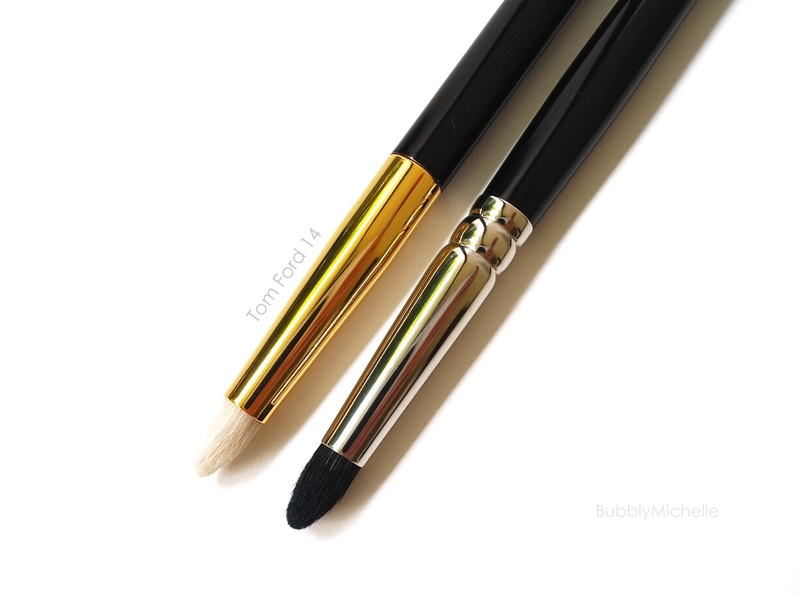 The TF 14 is the Smokey eye brush. And thank you for your kind comment. I actually like to post makeup looks that real people would wear everyday, what i'd wear everyday. So I am happy you enjoy seeing them! I really liked your review of makeup brushes. I have a question about the Hakuhodo you use for meteorites. – B002BkSL = K002 Powder Brush round and flat. Model: H3085? I use the S105 for meteorites. Thank you very much for answering .. had not imagined it could be the S105 !. Do you know either Hakuhodo mentioned: K002 and G5519BKSL? Do you think they could go well for meteorites? .. The truth is that not know the differences between the three .. I recommend the new La Mer Powder brush in case you’re still looking for a powder brush.